Riskplaza - The database of food safety risks. Riskplaza offers two tools for food safety hazards and food fraud hazards for ingredients. The tools provide answers to all your questions about these risks. Simple, clear and easy to understand. Legislation, standards and current issues are closely monitored, which keeps the databases up to date and accurate. An unambiguous answer offers clarity and assurance with regard to your audits. Know what you need to do because the control measure is specified. Put your organisation at a higher level. You will have control over food safety assurance. Exude confidence with the Riskplaza audit+ system. 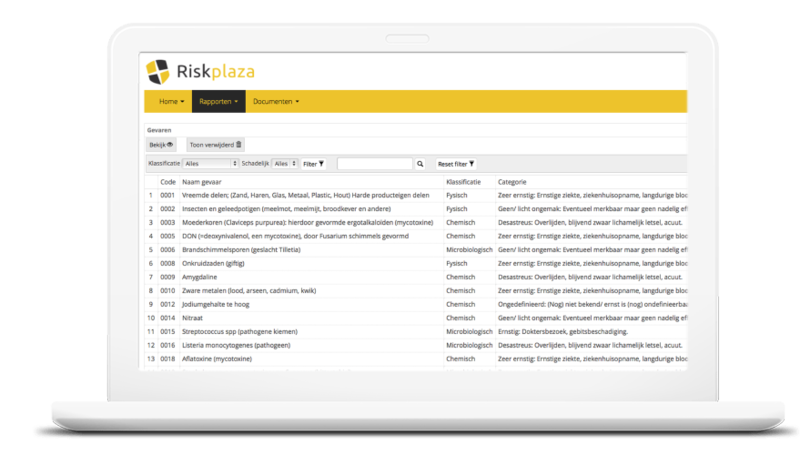 Riskplaza is the database for quality managers. Experience the convenience and pleasure of working with Riskplaza yourself. From addition, dilution to processing. Marketing Cookies are used to track visitors when they use our website. Their goal is to display content that is tailored and relevant to the individual visitor.